Indian squash player Saurav Ghosal won the El Gouna International Open trophy, held in El Gouna, Egypt on 9 April 2012 over Robbie Temple of England. The 18-year-old Shiva Thapa (56kg category) on 11 April 2012 became the youngest Indian boxer to qualify for the Olympics by beating Japan`s Satoshi Shimizu 31-17 to enter the final of the Asian qualifiers in Astana, Kazakhstan. While, India`s Vijender Singh qualified for the London Olympics in the 75-kilogram category. He is the first Indian boxer to qualify for the Olympics for the third time in succession. Vijender Singh is also the first Indian to win an Olympic and World Championships medal (bronze in both events). 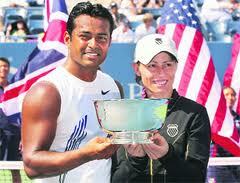 Indo-Czeck pair of Leander Paes and Radek Stepanek won the doubles title of Miami Masters on 31 March 2012. Paes by winning the Miami Titles took the total number of his career titles to 50.Paes became the 24th player in ATP Tour history to complete 50 doubles titles. World number one Novak Djokovic won the Miami Masters mens title by defeating Andy Murray. In the womens event Agnieszka Radwanska, won the title by defeating Russian Tennis star Maria Sharapova. Geeta Kumari , the woman wrestler, won a gold in 55kg category at the ongoing Asian qualifying tournament in Astana, Kazakhastan. With this victory she also made a history, as she became the first Indian woman wrestler to have ever qualified for the Olympics. China won the men`s world team table tennis championship title with a 3-0 victory over hosts Germany in the final held in Dormant (Germany).